Ever wonder what’s in a bloggers Disney bag? When we first moved here I was constantly forgetting something. It took me a while to figure out exactly what I needed to bring with me. And because I carry these things around with me all day (Disney bags can get heavy! ), every item has to earn its place. Let’s start with the actual bag. Many asked about my preferred bag to carry in the parks all day. It’s taken me a while to find some I can recommend. Due to the weight of the bag I prefer a backpack style. I often only use one strap so I can easily swing it around to reach something, but it does seem to have less shoulder strain than cross body or shoulder bags. I have two that I’m using now. Click the picture to go to the style above. Click here to see all of their designs. They have a ton of cute prints and colors and you can stop by Disney Springs when you first get into town and pick one up for your trip. The other backpack I have is more of a fun one. It doesn’t have the padded straps and isn’t quite as big. So I use it when I’m travelling a little lighter. 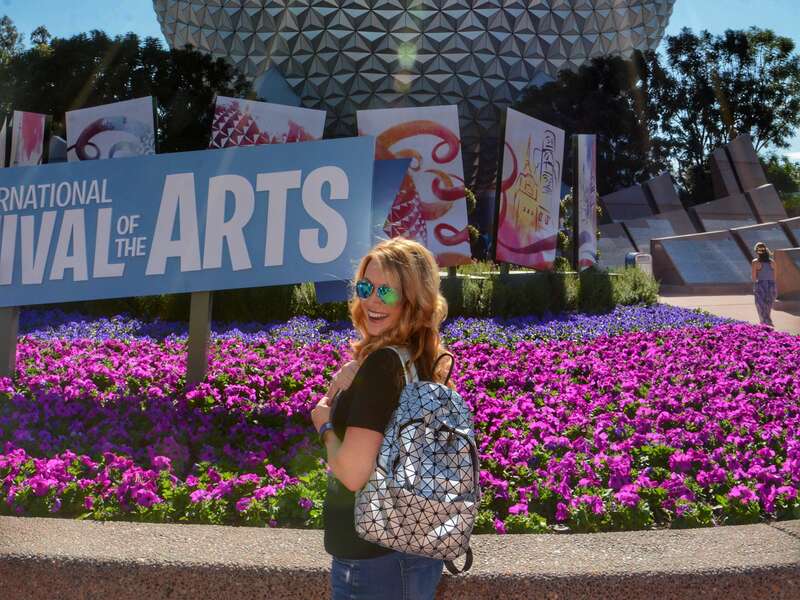 It’s not technically supposed to be a Disney bag, but of course, any Disney fan looks at it and immediately sees the geometric design from Epcot’s Spaceship Earth. Cute right? Update: I found a US source for the Spaceship Earth bag. It’s an Etsy shop called Castle Company. If the shop doesn’t have them, here’s the overseas shop: I ordered it here from the Asian online store AliExpress. They have good deals but things take a while to ship. I got this Disney bag in about 18 days which isn’t too bad coming from China. You can also get it on eBay. Compare prices by searching “silver geometric backpack”. I’ve only had it a few weeks but so far it’s held up really good. Now, let’s talk about the gear I put inside the bags. ***Sidenote: I don’t make anything off the above bags. I’m just including links to be helpful and because I have many people ask. I do have Amazon links for some of the things below, but please know I’m not promoting any of these to try to make a buck. I just want the links to you guys can easily find the stuff. I think so far I’ve made about $1.20 from Amazon, so woo-hoo! Starbucks on me! Actually, that’s not enough to buy Starbucks. It’s not even enough to buy McDonald’s these days. So scratch that offer. 🙂 Needless to say, these are my honest suggestions of the things I personally use and like. It’s not here for the money. (which is a good thing since I’d clearly be broke.) Also, please let me know if any of the links break. 1) Refillable water bottle that keeps water cold all day. I have bought so many water bottles thru the years. What a waste of money. Once I found this one it’s always in my Disney bag and I haven’t bought anything else. I’ve had mine for over two years, use it almost daily and it’s still looks new. The stainless steel construction means it won’t leak flavors into your water, ad is easy to clean. The double wall insulation means it will keep actual ice cubes in the bottle most of the day at Disney. I fill it with ice and then refill the water throughout the day. There is nothing like having ice-cold water when you are super hot. TIP: Any place in Disney that has fountain drink dispensers will give you free cups of ice water. Starbucks will as well. There is no need to purchase bottled water, Bring a few extra bottles to refill your fancy water bottle, and grab the rest for free from food vendors when that runs out. This one from Amazon comes in two great patterns. I get compliments on mine all the time. 2) Personal Fans: As we have covered, Disney World gets pretty hot in the summer. Check out my tips for dealing with the heat in this article here.A small fan can really help, especially when you are in tight queues and spaces where there isn’t much airflow. I like this one because you can wear them around your neck. Between taking pictures, looking at times and digging for water I never have enough hands free to just hold a fan. This type isn’t quite as powerful with the airflow as the other small ones you hold, but it can cool you while you wear it. It’s also safe for small kids with no visible blades. 3) Portable Charger: Between checking and booking fast passes, checking show times, taking pictures and video, and updating social media your phone battery will likely not last thru the whole day at Disney. You don’t want to have to worry about finding and sitting next to wall outlet to charge your phone. our time is precious. Invest in a charger and it will give you peace of mind to not worry about your phone dying, and it will probably come in handy more than just on Disney vacations. I use this one because it can go several days without needing to be recharged itself, and can support two charging cords if needed since sometimes more than one of us needs to use it. It’s a little bigger than some of them, but I’d rather not have to worry about charging the charger every single night. It’s one less thing to do. It’s never let me down. And believe me, it gets used a lot. It’s also handy to invest in another cord as well. I know you have the one you normally use for your phone at home, but you’ll be charging your phone with it during the night, then you have to remember to pack it back up for the day at the parks. It’s very easy to forget that and end up at the pars with your charger and no phone cord. Plus I don’t like dragging around my good apple lightning charger cord since I have been known to drop my cord in the parks and loose them. Once or twice. 3) Sunglasses: There are so many times I have found myself at Disney World squinting and thinking, where are my sunglasses, only to realize I was all ready wearing them. Yeah. The sun is that strong. Since glare is a big issue, finding some with polarized lenses will go a long way to making you more comfortable in the bright sunlight. I love my Ray Ban aviators. If you wear them a lot, they are worth the investment. But there are other cheaper ones to be found for sure. I have had pretty good success at Target finding polarized glasses that are perfect for cutting the Florida glare. 4) Good Camera for Pictures and Video: The camera on your phone does a pretty decent job of capturing memories, but if you want to get those fireworks shots, dark ride photos, etc… you need a good camera. The ultimate choice is a DSLR but if you know what those are you don’t need camera recommendations from me. This is the camera I carry with me everywhere. I love this one (I just got mine a few weeks ago) because it takes excellent video as well. So it’s the best of both worlds and even pocket-sized. It also has a flip-up screen to take selfies or vlog yourself. It’s not cheap (around $600 or so) but so many people ask me what I use. This is it. 5) Eye-Fi Memory Card: So you take those great Disney World pictures on your awesome DSLR camera or whatnot, but you really want to post one to Instagram while you’re at the parks. Do you have to take another, lesser quality picture with your phone and post that? Not at all. Here’s a blogger secret. Shhhh! Don’t tell anyone, ok? Ok. What I do is I use this eye-fi SD memory card. It works with any camera that takes a standard SD card. It creates it’s own WiFi network, then using the app you install on your phone, you connect to that “network” and download the pictures from the card straight to your mobile. From there you can edit with any photo editing apps you prefer (I love Snapseed) and post to any social medias you’d like. And voila! Your photos are looking pretty amazing, and they are posted live on the spot. Now don’t you look like a pro. The prices vary based on the GB size you want. When in doubt go bigger, especially if you plan on taking a lot of video. I have a 32 but most of you will be fine with a 16. ***Note: If you have a pretty recent camera you may have built-in Wi-Fi transfer. (the one I have above does have this feature) If so you won’t need this option. You can just connect your phone to your camera through bluetooth or WiFi and transfer them straight from there. But this card will give you the same feature in any camera you all ready have. 6) Earbuds for phone: This may not be something everyone needs, but I use them when periscoping, or watching and editing video playback on my phone. These are my favorite and they come in lots of fun colors.They don’t hurt my ears when I use them for a long time. Make sure you get the ones with the mic/remote since it sounds better and allows you to pause music and skip to the next track without pulling out your phone. 7) iPhone Clip-on Camera lenses: Are you ready for another trade secret? Seriously now. You gotta pinky swear to keep this one to yourself ok? Ok. This is my Periscope tip to look pro. It’s also my best selfie secret. This set of clip-on lenses attach right to your iPhone. There’s a set of three but the one you really want is the wide-angle one. Basically it gives you a wider view, perfect for capturing shows and parades, BUT, you can clip it to the front facing camera (that you use for selfies) and guess what. It gives you longer arms. Well, not really. But that’s what it looks like. It pulls the camera view wider and back it away a bit. Those full outfit photos you’re trying to get? Done. The group selfie (#squadgoals anyone?) with eight people and half of them have their heads cut off because you couldn’t fit them all in? No problem. Best 11 bucks you’ll spend. You’re welcome. 8) Touch Up Makeup: This one’s for the ladies. With all that running around and sweating in Disney World you’ll need a little help to stay looking fresh. Goodness knows you will taking lots of pictures and you’ll want to look nice. (For tips on what pictures you should take check this article out.) I’ve tried setting sprays and haven’t been real impressed with any of them. (if you know of a good one let me know!) But I do love this face powder, I keep it in my park bag and it offers light to full coverage depending on how heavy you apply it. It’s the best one I’ve found that doesn’t cost a fortune and lasts a long time. It doesn’t sweat off easily but I wouldn’t say it’s sweat proof since I don’t know that’s really a thing that can exist in Orlando. At least not for me. But it’s pretty close. 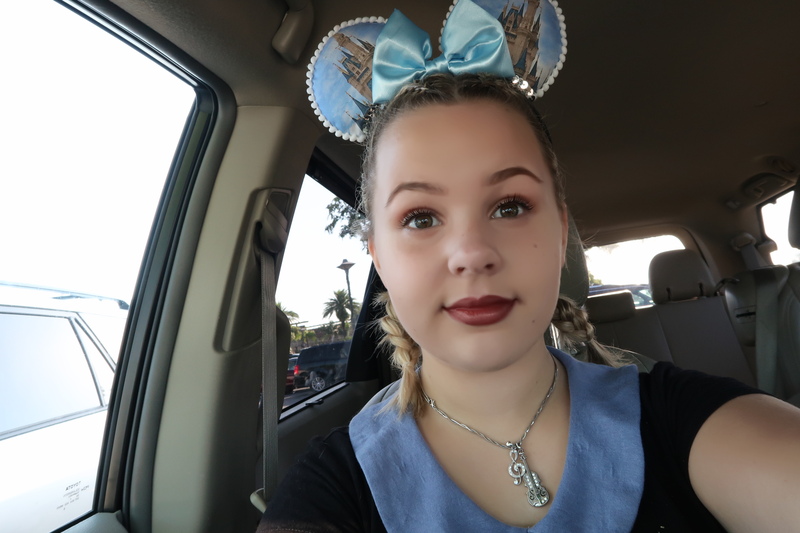 9) Custom Ears: If you go to the parks often, or you’ve been going for years then you probably have all the basic traditional ears that they sell in the parks. They have gotten some better ones in the official Disney stores lately but there’s still not that many to choose from. Plus the Disney parks ones are tight right behind the ears and after I wear them for hours they start to give me a headache. It was in this time period that my daughter Chloe started making ears for us since we couldn’t find any we liked online. She practiced hard and tweaked them a lot. (I’m extremely picky. You’re probably not surprised by this lol.) She got great at making them and I loved wearing them. Over time people asked where we got our ears and she has since started her own shop. I pretty much only wear them so if you’ve seen my wearing ears you liked they’re probably hers. ***Update 1/17: Chloe has put her shop on hold to focus on her music. (she’s a violinist and got accepted into a Youth Symphony) So you won’t be able to get ears from Roses Painted Red right now. 10) Rain/Sun Hat: It rains quite often here in Orlando. Pretty much every day in the summer. But the rain can be your friend; it clears out crowds and lowers the temperature. It’s rare that a whole day will be rained out. More often it’s only a couple of hours in the afternoon. I don’t mind the rain as long as I have a hat with me to keep it off my face and eyes. It’s easy to clip one to your bag or belt loop and have it if you need it. And if you’re bringing a hat it might as well be a cute Disney one. There’s many in the shops in the parks or you can check DisneyStore.com to buy online. Here’s one of my favorite Disney inspired hats from Zootopia. 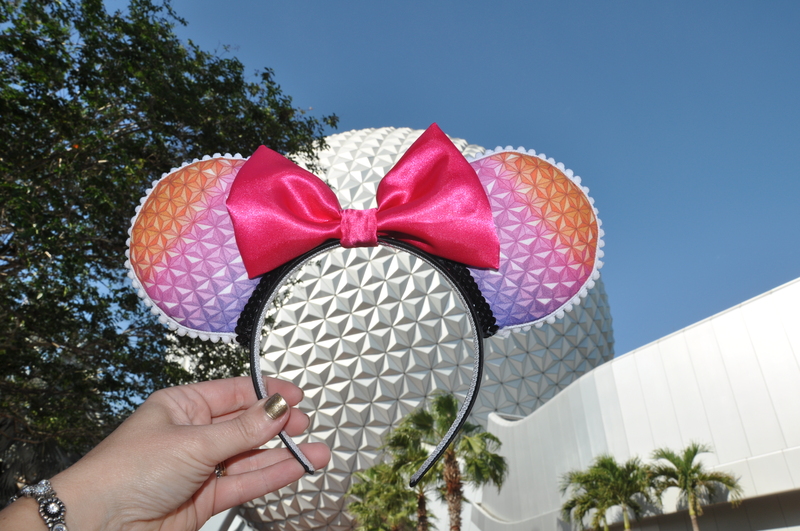 Hope these suggestions helped you in knowing what to bring for your Disney vacation! If there’s something I didn’t cover that you’d like to know about leave me comment below.